This past winter was relatively mild for snow accumulation, but there was plenty of wind, rain and ice. While you stayed safe inside, your home bore the brunt of this bad weather. As the spring season arrives, use this simple checklist to ensure your home is safe and ready, inside and out. Due to heavy rainfall, your home’s roof and gutters may have suffered some wear and tear. Whether high winds knocked down tree branches or swept debris into your gutters, it’s important to check for any and all damage. On a warm afternoon, spend some time giving the roof and gutters an inspection. While you may not be able to see every problem on the surface, you can spot missing roof shingles or clogged gutters. 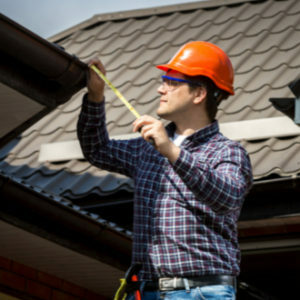 If you don’t feel comfortable on the roof, hire a professional to perform a thorough inspection. Chances are your doors and windows stayed closed most of the winter. Now is a great time to test all entryways to your home to check for irregularities. After being closed up for so long, windows and doors can stick, warp or develop drafts. Unlike the roof, this type of maintenance is easier, safer and can be done quickly. Look for signs that indicate the doors and windows may need replacing such as mildew, cracking and the inability to shut completely. Another area to pay attention to are the pipes, ducts and vents in your home. During winter, it’s easy for pipes to burst and ducts or vents to clog. This is particularly important when it comes to your air conditioning unit. Soon, hot weather will return and you don’t want to wait until the unit is running to discover damage. Also test the faucets outside the home to ensure there are no leaks. Following this checklist will help you spot signs of damage early, so you can have it fixed in time. If you’re looking to move in 2019, view By Carrier’s active communities!